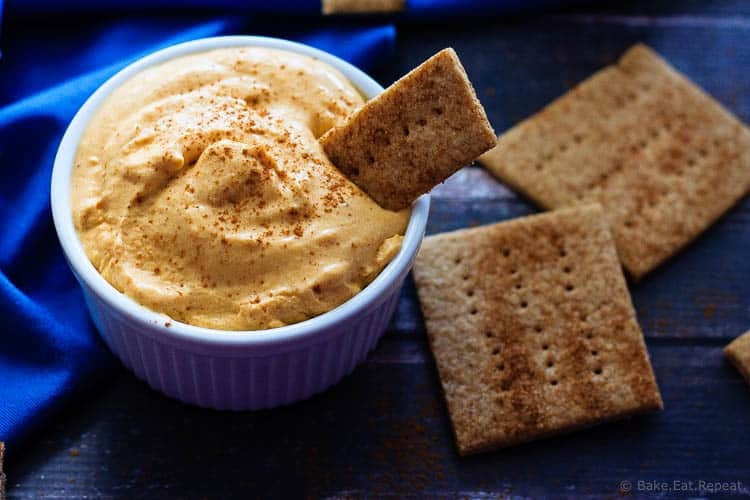 A quick and easy pumpkin pie dip that tastes just like pumpkin pie, but in dip form! The perfect light dessert! I finally have something for you involving pumpkin! I’m so excited for my first pumpkin filled recipe. I love, love, love pumpkin and bake with it all year long – it’s definitely not just a fall thing in my house. Pumpkin, pumpkin spice, all the pumpkin things are amazing as far as I’m concerned. My husband doesn’t agree at all. He’ll eat pumpkin things occasionally in the fall, but any other time of year, he’s not really that interested. And he thinks pumpkin spice lattes taste like a candle and need to go away. I don’t even understand that. They’re amazing. I am definitely getting around to making homemade pumpkin spice lattes this year just so that I can have them constantly without paying a small fortune for them! Not that this recipe has anything to do with lattes, but whatever. Pumpkin pie dip. That’s what we have today. Basically this is my Grandma’s pumpkin pie recipe, but in dip form. That’s exactly what it tastes like. Without the baking and the eggs and the pastry of course. Super fast, super easy, and super tasty. This dip makes a great light dessert, and a perfect snack. It was a fantastic way to have a taste of pumpkin pie without all the effort of making a pie! 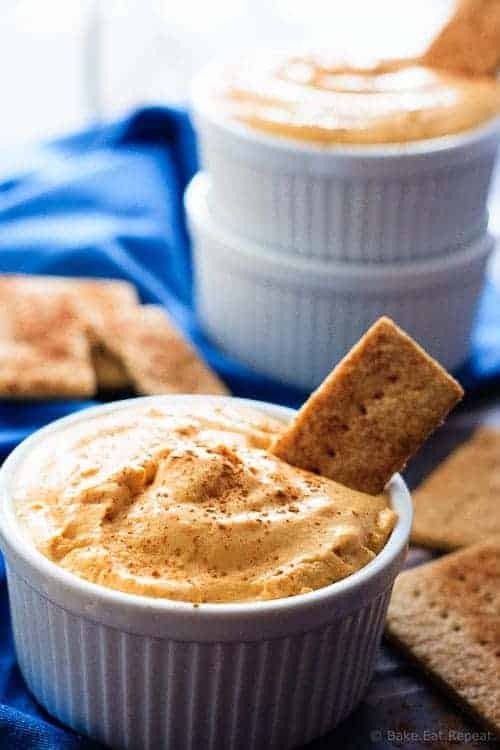 Whipping cream, yogurt and pumpkin puree are whipped together with some sugar and spices to make this great tasting pumpkin pie dip. We loved this with graham crackers and some fruit to dip in it. The kids can’t get enough of this stuff and ask for it constantly in the fall. 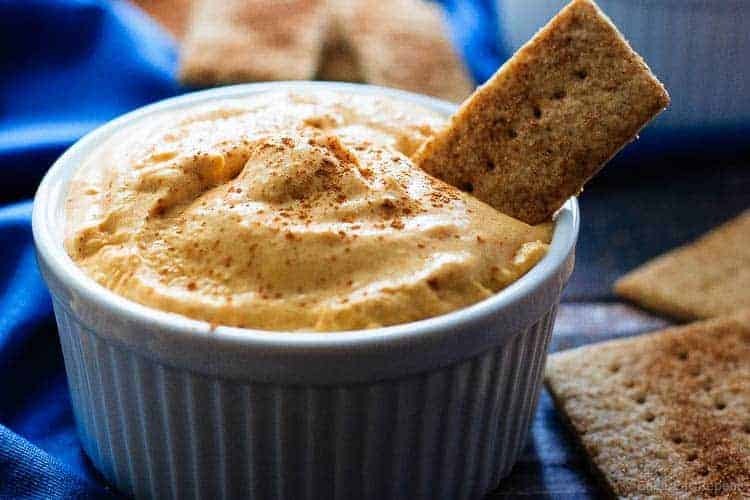 So if you’re craving pumpkin pie but don’t actually want to make a pie – try this dip – you’ll love it! In a large bowl with an electric mixer, or in the bowl of a stand mixer, whip the heavy cream and the plain Greek yogurt until soft peaks form, 2-3 minutes. Gradually add the white and brown sugar, with the mixer running, and continue beating for another 1-2 minutes until the sugar is incorporated and stiff peaks form. Stop the mixer and add the pumpkin puree and spices. Whip the mixture again to fully combine everything, another 30-60 seconds. Store the dip in an airtight container in the refrigerator for up to 3 days. Serve with fruit or graham crackers for dipping. I haven't ever tried it, but if the texture is similar I would imagine that that would work! Let me know if you try it out! this is such a quick way to satisfy your pumpkin pie craving! YUM! I am obsessed with this recipe, Stacey! Pumpkin pie in dip form?! Best idea ever! Yeah, he's crazy. I definitely love pumpkin anything! Thanks Jess! Tastes like a candle? That is HILARIOUS. And kind of true, too. I see where he's coming from. My husband's not that into pumpkin either, nor is my dad. Maybe it's a girl thing? I love this dip! It's so perfect. Forget your husband, I'll come eat it with you! Mmm I love baking with pumpkin all year long, too! And pumpkin dips are one of my favorite treats. This looks fantastic, Stacey! I think I could just dig in with a spoon! I may have done that. :) Thanks Gayle! Looks delicious and so easy! Pumpkin anything is my favorite!! I love anything with pumpkin! This dip looks great! Pinning to make it soon! I think pumpkin should be eaten all year too! This dip sounds marvelous! Pumpkin should definitely be eaten all year - one of my favourite things! Thanks Christin! Oh pumpkin makes me so happy! I love how easily this comes together! Exactly! Although I'm still gonna have to make pumpkin pie soon, but this dip was nice and quick and gave me that pumpkin pie taste! Thanks Maryanne!